This is the third post in a series of introductions by Sustainable Community Organizers working in the Midwest. 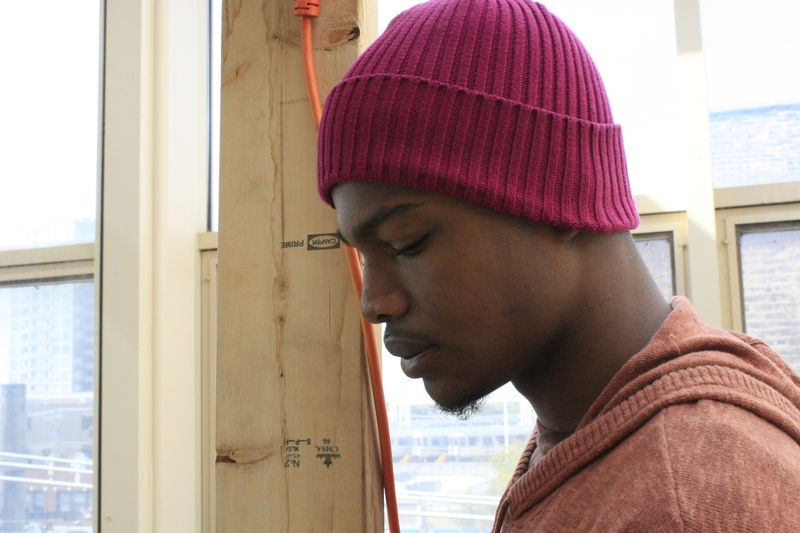 This post is by Lookman Muhammed from the Chicago Summer of Solutions program. My name is Lookman Muhammed. I’m originally from Nigeria, I’ve been residing in Chicago, IL in the Rogers Park neighborhood for 15 years since the age of 3. I initially began working with Summer of Solutions LETS GO Chicago based at the United Church of Rogers Park on the north side of Chicago under Peter Hoy. From the month of May 2012 up until August I worked building rain gardens, advocating for more sustainable ways to live, and educating the community on how to grow food and become sustainable. At first I looked at this as simply a job where I can make money to provide for myself and my unemployed mother. 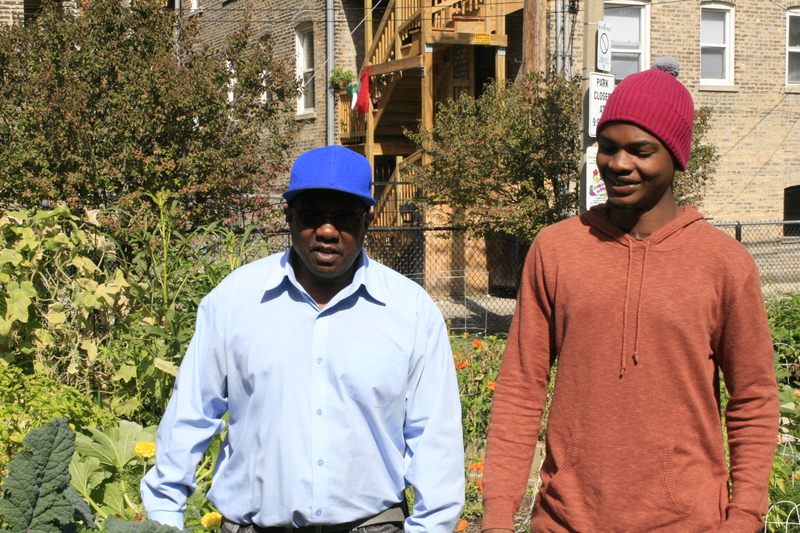 But after these long months of being around nothing but people who were so passionate about urban agriculture and changing the Rogers Park community for the better It rubbed off on me and I started loving this job much more than I did in the beginning of working with Summer of Solutions. I completed the summer program and learned about the many possibilities that exist if we can spread this idea of sustainability throughout the country. The many jobs that can be brought to the U.S. and the possibility of ending hunger appealed to me the most because of the growing poverty I’ve witnessed in Chicago over the years. My supervisor Peter Hoy then referred me to a man name Anthony Boatman, director of The Genesis Project of A Just Harvest (AJH). Anthony Boatman, known as Tony, on first impression seemed to be just a jolly, educated, old man. But after just a week of working with him I discovered he was more than that. Tony Boatman was like me, a man who has made mistakes in his past because of difficult situations. I was able to connect and relate to Tony on many levels. Today’s date is September 29th. It’s been more than a month since I began working with Tony Boatman and the work I do already means so much to me. Tony’s work helps many people. They grow food to feed one of the most low-income areas in Rogers Park, an area where I lived in for most of my life. One main thing you should know about AJH is they have a food kitchen where they feed anyone and everyone who walks through their doors. Someone can walk in, have a seat at a table, and wait to be served a healthy and full meal. They feed almost 175 people a night. Imagine what kind of impact this makes on this community. I’m working on growing food and organizing community members with AJH for the next few months. 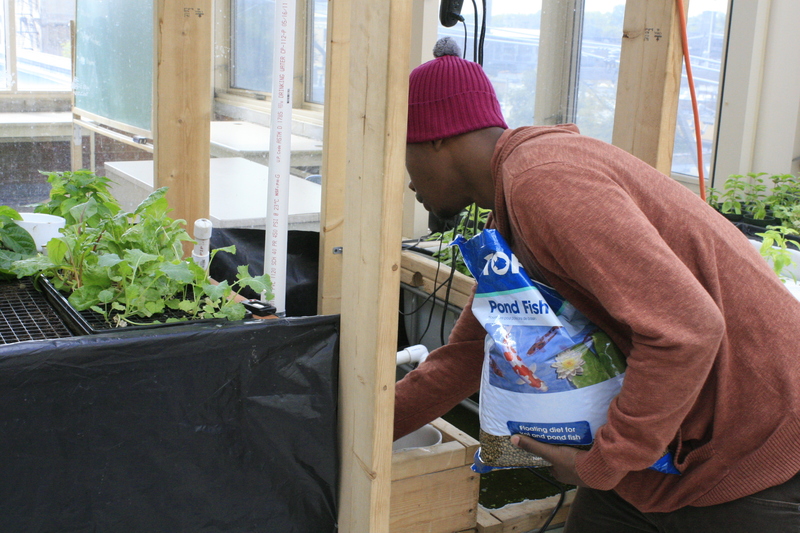 Lookman feeds the fish at the aquaponics system in the greenhouse. AJH has a greenhouse located in Gale Math & Science Academy where they grow a number of plants and some food such as peppers, herbs, micro greens, and chilis. Some of the food grown here is sold to help fund the work of AJH. The most interesting thing about this greenhouse is the aquaponics system that is the reason for the abundant growth within the greenhouse. My main duty at AJH is to make sure this aquaponics system is running properly and to maintain it. I feed the fish inside the system, clean it, and fix whatever problem there may be with it. But I am new to aquaponics, and honestly I need to read more and learn more on it. I follow the lead of another apprentice for AJH name Sergio Cullum, who has been working there much longer than I and knows so much more about aquaponics and how it works than I do. Additionally, I work with the Northside POWER project of AJH, the community organizing component. Northside POWER, which stands for People Organized to Work, Educate and Restore, is a team of individuals who organize community members to fight and stand up against oppression that suppressed a part of the Rogers Park community. In the beginning of September, Tony, Sergio, and I were led by members of Northside POWER to a block party being thrown by the neighbors of a Chase Bank board member. Chase Bank buys a lot of low-income property in the North Side of Chicago, which is usually turned into foreclosed condominiums and this affects many families. Our plan was to crash this block party full of upper-class rich colleagues of the board member. Members of Northside POWER hopped on a pretty small stage that was meant for musicians to perform and sung a short song explaining how the actions of Chase Bank profits off of exploitation and foreclosures in the communities that they target. I personally felt this action wasn’t too effective and that the people at this party couldn’t care less as long as they’re rich (my exact words). But I enjoyed this so much because it gave me an idea of how to organize a community to fight. To act and protest against something that is oppressing us as a whole community. Something like this builds unity. This entry was posted in Local Programs, Summer of Solutions and tagged aquaponics, letsgochicago, lookman, rogers park, sustainable community organizers by rubylevine. Bookmark the permalink.